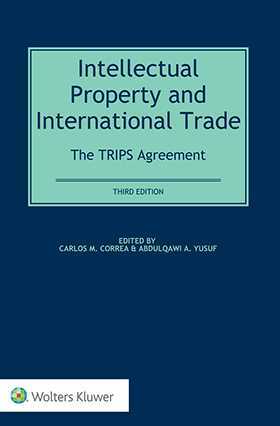 Intellectual Property and International Trade, now in its third edition, updates its comprehensive analysis of the substantive provisions of the Agreement on Trade-Related Aspects of Intellectual Property Rights (TRIPS). This Agreement is the most far-reaching and comprehensive legal regime ever concluded at the multilateral level in the area of intellectual property rights (IPRs). Compared to prior IPRs conventions, TRIPS constitutes a major qualitative leap which radically modifies not only the context in which IPRs are considered internationally but also their substantive content and the methods for their enforcement and dispute settlement. This much-welcomed treatise discusses the actual interpretation and application of the Agreement in different jurisdictions, with new material on the burgeoning case law and on major changes in plant variety protection. interface between competition law and intellectual property protection. With fifteen chapters contributed by a distinguished panel of experts representing diverse fields –international organizations, legal practice, government policy, and academia – the third edition offers an incomparable framework for understanding the background, principles, and complex provisions of the TRIPS Agreement. This book elucidates the interface of competition law and intellectual property protection and discusses the interpretation of some TRIPS provisions by recent WTO jurisprudence. Thoroughly revised and updated, the third edition will be of great value to all professionals and business people concerned with international trade. It stimulates further discussion and analysis in this area of growing importance to international law and international economic relations, particularly regarding the possibilities offered by the Agreement and the loose ends that may need consideration in the future at the national or international level.